SAMUEL MUGRIDGE was born circa 1838 in Kittery, ME [Descriptive Roll] to the Deacon Benjamin and his first wife Mary R. Odiorne [see notes below]. 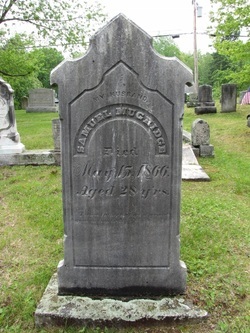 He died on 15 May 1866 at the age of 28 years and is buried in the First Christian Church Cemetery in Kittery. He married, around 23 Sept 1863 [intents filed in Kittery on this date, VR of Kittery, pg 487], to ANN M LINSCOTT of York, Maine. The daughter of Samuel and Nancy (Nowell) Linscott, she was born in York, Maine on 18 Feb 1845, and died on 9 May 1929 in Eliot, Maine. She remarried to Sedley Grant of South Berwick. Samuel is seen with his parents in the Kittery censuses for 1850 and 1860 (at ages 12 and 22, respectively). I. MABEL ESTELLE MUGRIDGE, born 4 July 1864. She married JOSEPH HENRY MANSON on 7 Sept 1885 in York, Maine. Benjamin Jr of Kittery married Mary R Odiorne of New Castle, NH on 9 Nov, 1834 - she died in 1848. He marr 2nd Abby N White in 1850, who died in 1853. He then marr Almira P Graves in 1855, with her dying in 1876. He marr a 4th time to Mrs Clementine Graves, widow of Capt Alexander, in 1877. Only his 1st marr rec calls him Jr - his father Benjamin died in 1839. Most of the Mugridge family of Kittery are buried together in a plot at the First Christian Church Cem in Kittery [YCCI, pg 1031-32].